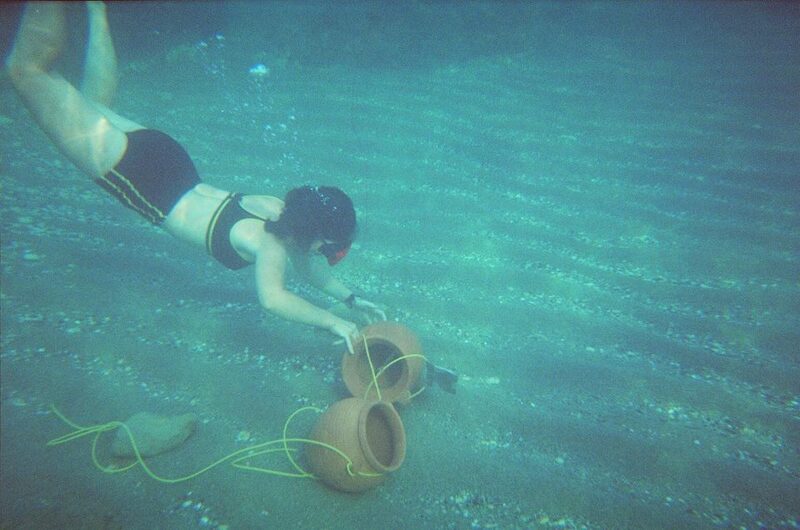 Deborah Ruscillo is an anthropological archaeologist, studying material remains to reconstruct ancient lifeways. 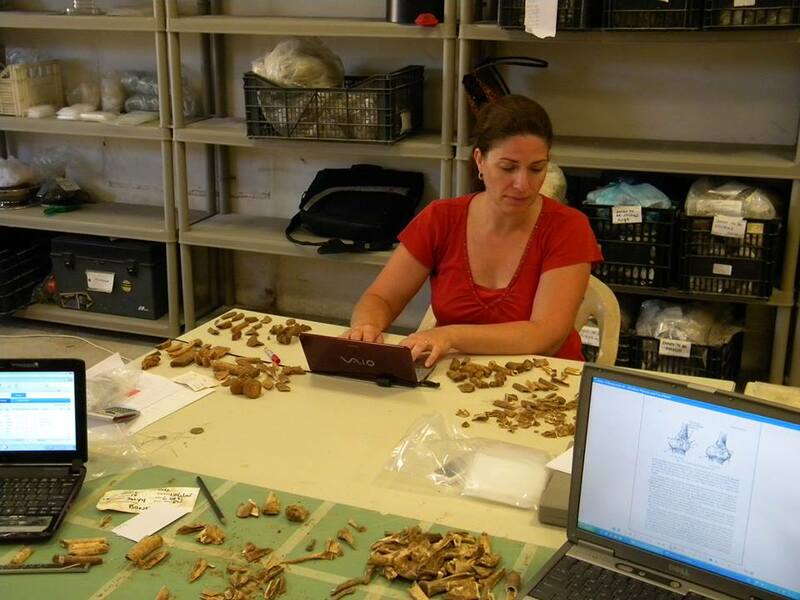 Her specialty is the study of faunal remains which is a multidisciplinary field combining social/cultural anthropology, ethnology, archaeology, history, zoology, and environmental studies. Whether she is studying bones from archaeological sites, excavating, or performing archaeological experiments, her objective is to gain a better understanding about the people who occupied the site which she is studying. Her passion is educating the public through artifacts, either from excavations or in museum collections. She believes that stories of culture reside in ritual and material remains and that some of those stories can still be told. Human expression and the ability of people to find or manufacture media in their environment with which to express their experiences is infinitely fascinating to her. By extension, paleoenvironments provide clues as to what resources were present in antiquity. iii)	Experimental archaeology, ethnoarchaeology, and ancient industries. Not only do animal remains reflect the activities of the people who herded and hunted them, they can also provide clues about the environment in antiquity. Dr. Ruscillo is interested in the environmental changes at a locale, particularly how human habitation has affected the natural history and ecosystems in the area. This information is primarily provided by wild game, bird, fish, and land snails recovered from a site. Identifying domesticates, however, can indicate how humans have affected the environment during their occupation – forests can be cleared for corraling and pastures, while grazing and defecating can alter the flora in an area. Dr. Ruscillo has worked on several sites where environmental changes have been apparent from studying the faunal remains. Excavations at Iklaina in southwestern Greece produced land snails that were not typically found in olive groves, the current landscape. Instead, these ancient mollusks indicated that the palace site was surrounded by lush green forests in the Bronze Age. The identification of red and roe deer, wild boar, and bear specimens also attested to the forest environment instead of the open fields used for agriculture, as they are today. At Bonjakët in Albania, hundreds of cockles found from excavations of a sanctuary site were neither marine remains, nor debris from food consumption. Instead, they were naturally deposited shells from the brackish waters of the estuary that flooded the site for centuries after the sanctuary was abandoned. The famous Mesolithic site of Starr Carr in the UK has an extensive assemblage of cervid remains. One main question of excavators was to determine in what season the site was occupied. The original hypothesis was that the site was occupied in the winter (Fraser and King 1971), later to be refuted in further investigations by zooarchaeologists Legge and Rowley-Conwy (1988). Two decades later, Dr. Ruscillo examined the faunal evidence using her new morphological Mean Shape Method to distinguish between male and female specimens to concede that the site was indeed occupied in the winter. This finding was corroborated in 1998 by Richard Carter using radiographic techniques to study mandibular development. Fraser and King were correct after all. Dr. Ruscillo is thus interested, not only in the human/animal relationship in antiquity, but also in defining the human relationship with the surrounding landscape. Research in the reconstruction of the ancient landscape is on-going at the site of Iklaina in southern Greece. The Program for Regional Investigations of Sustainability in Messesnia, or PRISM, seeks to combine these data with modern environmental studies to identify trends in regional environmental changes in anticipation of the development of Messenia for tourism. The standard questions posed to zooarchaeologists are: what did ancient people eat? What food resources were exploited? Did they keep domesticated animals, and if so, did they keep them for primary and/or secondary products, or keep them as animal wealth? How did they exploit these animals? Did they hunt local wild species? What economic strategies were used by different societies (e.g. extensification vs. intensification)? How were animal products distributed among different social groups and what kind of information can animal exploitation strategies give us about social organization? These questions have economic ramifications, especially in antiquity where herding livestock was the livelihood of many pastoral and agricultural communities, and trade and herd maintenance were the basis of many economic systems. 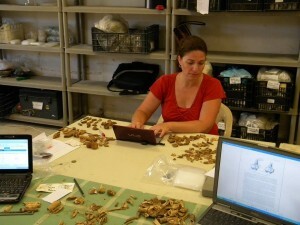 Through the study and interpretation of over twenty zooarchaeological samples, including bone and/or marine remains, Dr. Ruscillo has discovered that every site offers different evidence and unique insights into the lives of the people who created them. For example, the bone samples excavated from the acropolis in Mytilene reveal a change in diet through the ages of 24 centuries of habitation of the site. Differences in animal selection and exploitation can be defined for each period, and can be combined with other contemporary archaeological evidence (i.e. pottery, architecture, etc.) to expand the scope of interpretation for each culture. For example, pig remains increased during the Roman occupation of the site, while they decreased significantly during the Ottoman occupation, presumably due to Muslim prohibitions on pork consumption. Another example of zooarchaeological inference comes from excavations of a local St. Louis site on Lemp Avenue downtown. Excavators at the Lemp Avenue site in Missouri wished to identify what animals and which portions of animals were consumed by slaves on a plantation two centuries ago. Meanwhile, excavations at the Wadi Ziqlab in Jordan examined the early protein sources of the Kabaran, pre-Neolithic populations in Jordan during a time of transition between the exploitation of wild species of grains and animals, and domestication of these resources in later periods. At the site of Stymphalos in the northern Peloponnese, as well as Kommos in Crete, and Iklaina, faunal remains give insight into the economic and ritual lives of the inhabitants of the site. All these faunal assemblages have been published, and have been cited as examples and comparanda in other relevant works. The combination of zooarchaeological and textual (where applicable) information can be a powerful tool to investigating social, cultural, ritual, and economic choices of ancient peoples. 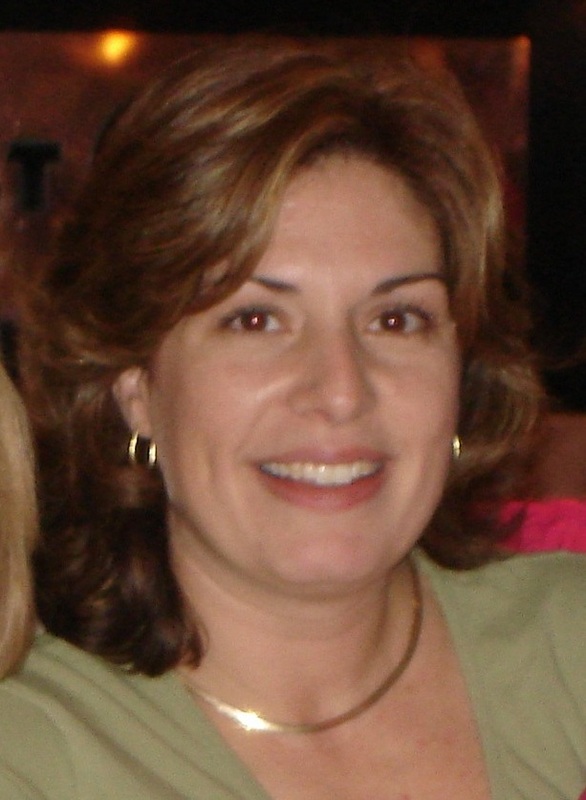 Dr. Ruscillo is interested in all forms of information extending from the study of ancient debris. In order to expand our knowledge of material culture and how objects were made and used in antiquity, the archaeological context is examined closely. To further provide clues about objects and industries, indirect sources of information must be explored. Two methods for extrapolating ideas to interpret objects and processes are through experimentation and through ethnographic studies. 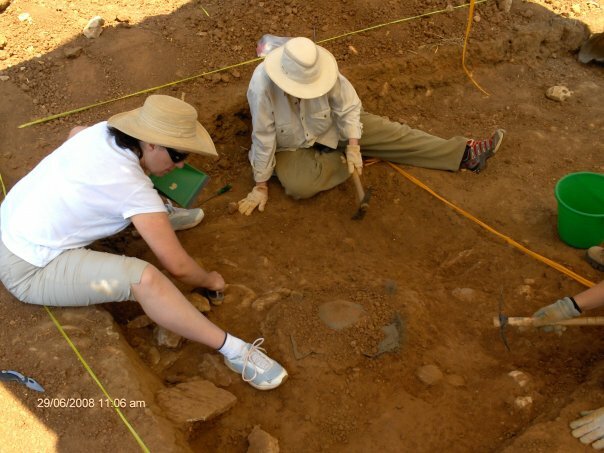 By conducting experiments, archaeologists can reconstruct specific processes using a variety of methods and materials to produce an understanding of how objects were manufactured or used. Also, consulting ethnographic sources, either in text, iconography, and/or talking to informants involved in traditional industries, ancient methods and tools of manufacture can often be determined. Dr. Ruscillo is interested in ancient industries, particularly in textile and dye manufacture. Through experimentation and ethnological research of ancient texts and speaking with villagers in Crete, she gained a better understanding of Minoan purple dye production using the marine gastropod Murex trunculus, and was able to reconstruct the methods required to produce purple dye and purple dyed textiles. This work has received considerable attention by Aegean prehistorians, and even the Jewish community interested in reviving Tekhelet, the Biblical blue color of the traditional Jewish prayer cloth made in antiquity using Murex. The trade of purple and blue in antiquity was extensive, and was an important commodity in the ancient Mediterranean. Her endeavor to identify locations of production and ports of trade will have a great impact on our understanding of economic relations in Bronze Age Greece. Furthermore, identifying locations where Thais haemastoma once existed versus where it exists today has important ramifications for identifying how the Mediterranean has changed in salinity, temperature and C02. This is on-going research which will result in a volume on Purple and Blue in Antiquity.